FURUYA Teruo studied shakuhachi with YOKOYAMA Katsuya from the age of 18. Parallel to his initial shakuhachi studies with YOKOYAMA-sensei, he enrolled at Tokyo Gakugei University of Education and Liberal Arts, graduating in 1971. A few years later, he commenced public performance with shakuhachi, giving his own solo recitals from 1980 onwards. He has toured outside of Japan extensively with Yokoyama-sensei, as a soloist, and also as shakuhachi performer with the drumming ensemble Ondeko-za. Since the 1990s, he has been integrally involved in the World Shakuhachi Festivals, as organizer, and as teacher/performer. He has contributed to numerous CD recordings and radio broadcasts, and has himself composed for shakuhachi. Currently, he is a director of Ranposha Chikushinkai and is the head lecturer of the Kokusai Shakuhachi Kenshukan. He also takes a leading advisory role in matters concerning Japanese traditional music with NHK, at music competitions, and at Tokyo Gakugei University. 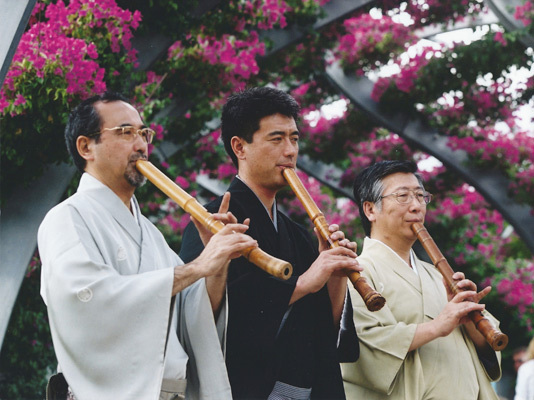 KAKIZAKAI Kaoru studied shakuhachi firstly with SAITO Seido, and then from 1982 with YOKOYAMA Katsuya. He graduated from the NHK Traditional Music Conservatory in 1987. 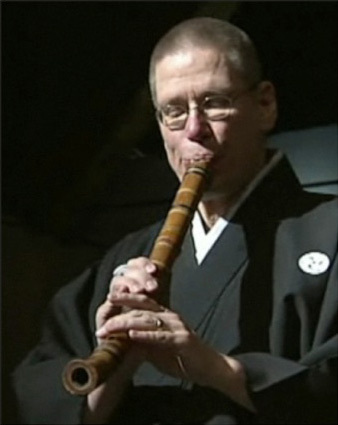 Since then he has been awarded numerous prizes for shakuhachi, and has performed throughout the world at festivals, notably the first International Shakuhachi Festival in Bisei, and World Festivals in Boulder, New York, Sydney and Kyoto. He engages deeply with contemporary as well as traditional music, and has frequently performed key works such as TAKEMITSU Toru’s “November Steps” in Japan, Europe and the USA. He is currently a lecturer at Tokyo College of Music and instructor at the NHK Culture Centre, and one of the principal instructors and administrators of the Kokusai Shakuhachi Kenshukan. He heads the Chichibu branch of this school. MATAMA Kazushi commenced playing shakuhachi at the age of 17, and began intensive studies of the instrument with YOKOYAMA Katsuya a few years later, after graduating from Hosei University in Tokyo with a degree in history. In parallel, he studied at the NHK Traditional Music Conservatory, graduating in 1973. His first recitals and concert tours took place in the following years; he often journeyed with YOKOYAMA-sensei to Europe, the Americas and Africa. MATAMA-sensei has been a key figure in the development and organization of the World Shakuhachi Festivals, commencing with Bisei (Japan) in 1994 and Boulder (1998). As teacher and performer, he has had an ongoing connection as to the usually annual Australian Shakuhachi Festivals and Rocky Summer Camps. At present, he is an instructor at the NHK Culture Centre, a primary instructor in the Kokusai Shakuhachi Kenshukan, and is a director of the Ranposha Chikushinkai and president of Yokohama Chikushinkai. Furuya-sensei, Matama-sensei and Kakizakai-sensei will give individual lessons in days before the Summer School (16th – 18th June). Please see bottom of the page for more details. Véronique Piron is a master performer of the shakuhachi based in Brittany, West of France; she received her shihan-licence from Yokoyama Katsuya in 2002. She teaches shakuhachi primarily in the style of the KSK school in Paris and in Brussels, and as a licensed conservatoire teacher she is introducing Japanese music in the conservatoire and high education system in France. She is performs widely in a traditional programme with the Japanese string player Fumie Hihara, as well as an intercultural new music programme with pianist Lydia Domancich. Presently, she is investigating a new project with the traditional music of Brittany. 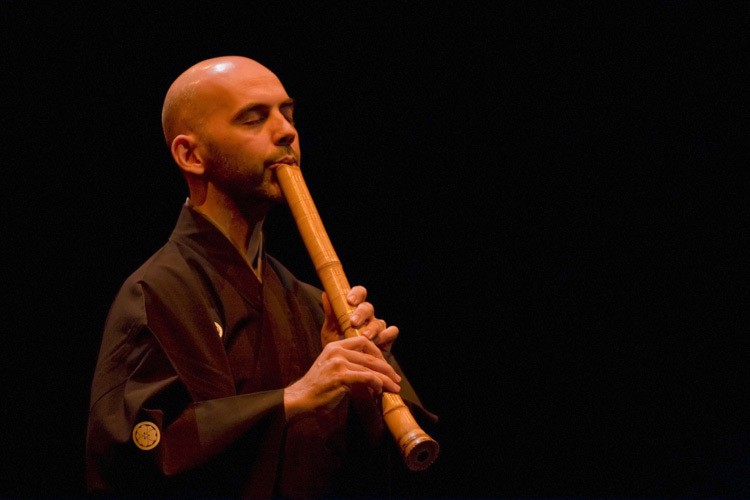 Horacio Curti discovered the shakuhachi in India and traveled to Japan to study under Kakizakai Kaoru sensei. There, he received his shihan-licence from Yokoyama Katsuya in 2004. Having specialized in Yokoyama sensei’s Honkyoku, he later developed a strong practice in contemporary musical forms, from Western classical contemporary music (working with composers and premiering new pieces), to working with poetry or in the field of free improvised music together with other musicians or dancers. His released recordings include a solo CD (Ichi, Agharta Music) and a Book-CD in Catalàn of Zen Stories together with Marta Millà (Contes Zen, petites históries per despertar. Ed. Viena). He has taught and performed in Europe, Asia, North and South America. Dr. Gunnar Jinmei Linder studied with Yamaguchi Gorō from 1985 to his untimely parting in 1999. Gunnar also studied at the Tokyo National University of the Arts for four years, graduating with an MA in shakuhachi as performing art in 1997, and received his shihan master license from Yamaguchi in 1998. He has been performing and teaching extensively, both in Japan and Europe, and moved back to his native Sweden in 2005 after 20 years in Japan. Gunnar also holds a PhD in Japanology, and is presently working as Associate Professor at Stockholm University. 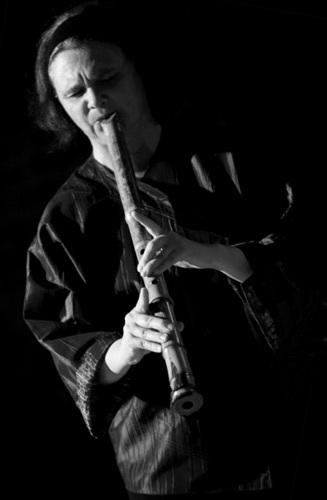 French-born flutist Suizan J.-F. Lagrost devotes his talent more or less equally to both the concert flute and shakuhachi. Having been awarded a shihan-licence from the Tozan school he pursues an international career in traditional (Tozan, Chikushinkai), contemporary and mixed repertoires. He has been teaching in two conservatoires near Paris for fifteen years. Dr. Kiku Day studied jinashi shakuhachi playing in Zensabō style with Okuda Atsuya for 11 years in Japan. 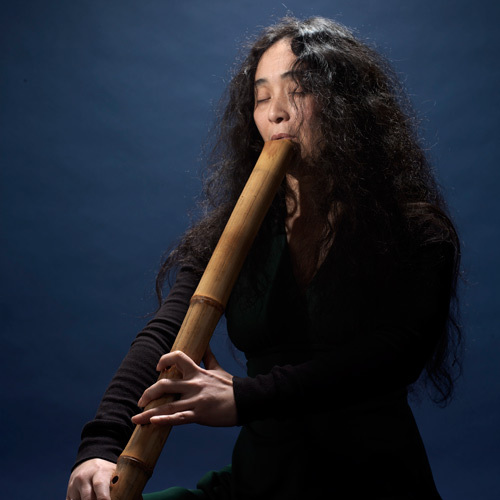 After returning to Europe she has completed a PhD in ethnomusicology and performance while continuing to explore the possibilities of jinashi shakuhachi in contemporary music. She is a founding member of the European Shakuhachi Society. Dr. Vlastislav Matoušek studied composition and post-graduate courses in Music Theory at the Academy of Performing Arts, Faculty of Music in Prague, where he has been teaching ethnomusicology since 1991. There he received his Ph.D. degree in the theory of composition. In 1996, during six months in Japan as a fellow of the Japan Foundation, he studied shakuhachi with Mitsuhashi Kifu and Japanese traditional music with Prof. Yamaguchi Osamu. As a soloist concert performer he mainly plays honkyoku. He is artistic director and conductor of his contemporary music Ensemble 108 Hz, which presents experimental music and his own compositions for voices and instruments (sometimes exotic and folk instruments) from his personal extensive collection, often in combination with electronics. 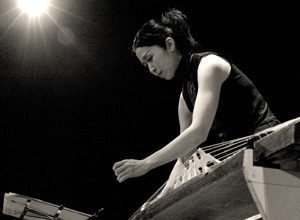 KIKUCHI Naoko gathered her first experiences with koto with her mother and grandmother, and in 1989 began studies in the Sawai School with SAWAI Tadao and Kazue; in 1997 she gave her first solo recital. During her time as a student at Sophia University in Tokyo, she took part in a world tour as a member of the Sawai Kazue Koto Ensemble. Subsequently, she graduated from the NHK Conservatorium for traditional music, and received her master’s licence. She has received numerous honors and prizes for her playing, including overseas cultural fellowships. Now a resident of Frankfurt, she pursues her international career not only in the area of the classical koto repertoire, but also with an emphasis on contemporary music and improvisation. She frequently collaborates on projects with other musicians, composers and artists. Dr. Jim Franklin initially studied composition and musicology in Australia, Germany and Holland. During his studies he encountered the shakuhachi. After learning the instrument in Australia with Dr Riley Lee and in Japan with Furuya Teruo and Yokoyama Katsuya, he received his shihan-licence in 1996 from Yokoyama-sensei. 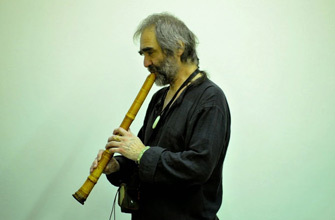 As a composer, Franklin writes music for shakuhachi solo and in combination with other instruments, and frequently performs projects with shakuhachi and live electronics. In the area of solo shakuhachi, he has specialized in the honkyoku of the Kokusai Shakuhachi Kenshukan and in modern music. 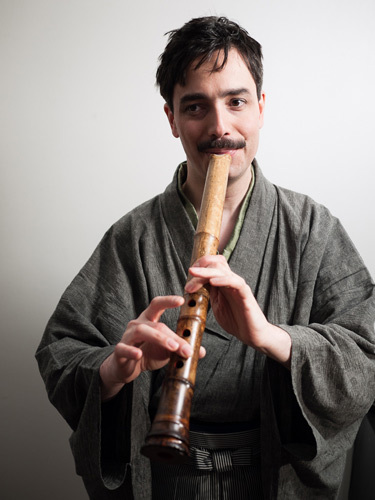 A resident of Germany since 2004, from 2006 to 2009 he was founding Chairperson of the European Shakuhachi Society. Beginners, intermediate and advanced. Instruction will be available for participants who have never played shakuhachi, and who are commencing at the Summer School. Plastic beginners’ instruments will be available for loan or purchase. PLEASE NOTE THAT INSTRUMENTS OF LENGTH 1.8 SHAKU WILL BE USED FOR ALL TEACHING. If you do not possess a shakuhachi of this length, you will need to obtain one before the Summer School, or borrow a plastic beginner’s instrument at the Summer School. In the days before the Summer School, 16th – 18th June 2014, Furuya-sensei, Matama-sensei and Kakizakai-sensei will be in residence at the Weltklsoter in Radolfzell, the venue for the Summer School. They have agreed to give individual lessons to Summer School participants who arrive in Radolfzell early. The exact timings are subject to confirmation, but at present it is planned that they will teach individually two blocks per day: 10:00-12:00 and 14:00-17:00. If demand is sufficient, these blocks may be extended. The price for a one-hour lesson will be €50, to be paid in cash directly to the teacher. It is possible to request more than one lesson and to work with more than one teacher. Requests for lessons will be dealt with more or less on first-come, first-served basis. If there is high demand for lessons, it may nevertheless be necessary to modify individuals’ requests, to enable the Japanese teachers’ time to be distributed equitably amongst those wanting to take lessons. This is a rare opportunity to work intensively with these three teachers outside of Japan, and a stay of an additional day or days in Radolfzell, in order to take advantage of it, is highly recommended!